EACH participating school will be allowed to bring 100 students to the Secondary Schools Track and Field Association (TTSSTFA) Schools Relay Festival at the Larry Gomes Stadium in Arima, next Thursday, from 9.30 am. However, for this to become a reality, the organisers are asking for more sponsors to come on board to help with transportation costs. Toco Secondary School and Queen's Royal College (QRC) are set to defend their titles. Toco are the defending overall, co-ed and girls champions and QRC won the boys crown in 2018. Students of Toco, QRC and Sangre Grande Secondary attended the event's launch at the Ministry of Education on St Vincent Street in Port of Spain, yesterday. The event will consist of multiple relay events including the popular 4x100m and 4x400m events, along with the 4x200m and 4x800m races. Boys and girls schools will also be allowed to team up and take part in the mixed relay events. Schools interested in participating can still compete as the registration deadline is Friday. One hundred students from each school will be allowed to enter the stadium free from either primary or secondary schools. President of the TTSSTFA Joseph Brewster is hoping this would encourage more support. He said, "We want to ensure that students come out and support their schools. We want them to come with their flags and their banners and their drums and all those other things that will add to the occasion." Brewster is asking corporate TT to help with transportation for athletes coming from Tobago. He said, "We have a couple of challenges that we will face this year...one of them is trying to get our schools from Tobago here. We know how difficult that could be so we are still working on that, with just over a week to go, to see if we could get Tobago to come because Tobago is full of talent." The TTSSTFA head also wants the rural schools in Trinidad to attend the meet. He said, "Another challenge that we have is the transportation (in Trinidad), especially for those outlying schools. We are hoping that someone in the private or public arena can reach out to help out with transport to give our students a chance to come and unleash their full potential." Brewster, who said the performances of the athletes will be highlighted live on television, thanked the sponsors who have assisted. "As we are growing our product, the event will be covered live by FLOW Sports. We have a couple of partners that have been very faithful to us and they are Blue Waters, Gatorade, SM Jaleel, Sunshine Snacks and of course our number one partner the Ministry of Education," he said. 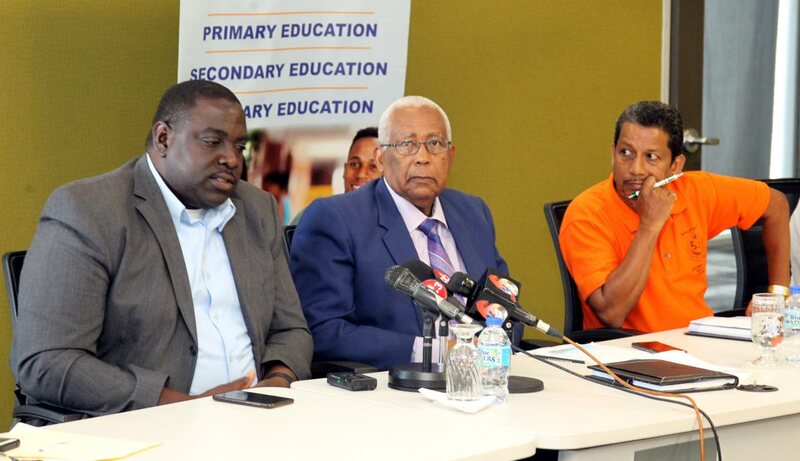 Minister of Education Anthony Garcia said the ministry is always in support of students participating in sports, as it helps students with their academics. Garcia said, "Sports is an essential aspect of our curriculum and it is important that our students are given the opportunity of displaying their talents, because whenever we find students who are showing that type of interest in the area of sports it usually transcends to other areas of their study." Reply to "Festive atmosphere for Schools Relay Festival"